A fascinating graphic memoir of a woman who has lived her whole life under the shadow of organized crime. I cannot compare it to the actual memoir, as I didn't even know about it until I stumbled upon this graphic novel. Still, it does pack a punch. Shoko's life is frightening and brutal and yet she finds ways to keep herself afloat. I have always wondered what life must be like for the women who are, by extension, part of the Yakuza families. Unsurprisingly, it's not too good. Overall, this is a good effort, with nice artwork, but more cultural information would have benefited it dramatically. It's hard to understand why Shoko makes some of the decisions she does, but one would imagine that there is likely something lost in translation, especially for the uninitiated. Interesting book of a delinquent in Japan. We all make questionable choices. This is the true story of Shoko Tendo. She was born into a life of luxury as her father was a powerful mob boss. In Japan these groups are known as Yakuza. However, when he father was sent to prison the family feel into debt. When their father returned home he had become a mean violent drunk and he never reclaimed any power in the Yakuza or any of the wealth that went with that status. As a young teen Tendo was bullied by her classmates and feel in with her older sisters gang. Tendo became a promiscuous drug addict and was arrested at 15. This is her story of how she grew into adulthood and finally gained self-respect and freedom from the abusive men in her life. It's actually 2.5*.I have this idea that Shoko-san's autobiography is as interesting as Yankumi's in Gokusen (I know it's a fiction!). However I thought that her life will be kind of different than non-yakuzas - that she got proper training in self-defence or at least her father brought her up in yakuza education. But, none I could find in this manga. Maybe her book is different? 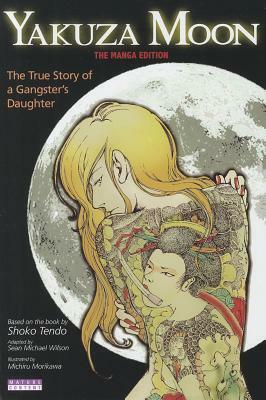 The manga adaptation of Shoko Tendo's 'Yakuza Moon' is a pulpy, purple memoir that has little to do with the Yakuza and more a recollection of bad boyfriends and other such unsavory characters. Michiru Morikawa's artwork is excellent and the highlight of this one. I think I would like to read the full version of this, the manga version is all experience, no depth or description, or scene setting. The art is ok, but with such historically rich material to work with and build on it certainly could have been better. I started it expecting the usual memoir of a drug addict similar to Christiane F.'s Wir Kinder vom Bahnhof Zoo, but it turned out to be a lot more self-critical and sober than that. I finished it with a great deal of respect for the author. Quick read. Decent graphics. Engaging enough to make me want to read the original work. Great work for Manga fans. The artwork is brilliant! Though, if you are interested or want to find out (more) about Shoko Tendo’s life, I recommend to invest a little time and read the real deal! Very interesting autobiography. I'm always interested in Japanese books since I lived there. Sean Michael Wilson Michiru Morikawa Shōko Tendō - Sean Michael Wilson is a comic book writer from Scotland. He has had around 30 books published with a variety of US, UK and Japanese publishers, including: a comic book version of A Christmas Carol ('Best of 2008’, Sunday Times), AX:alternative manga ( 'Best ten books of 2010’, Publishers Weekly), Parecomic (with an introduction by Noam Chomsky, his first contribution to a book in graphic form). He is currently writing books for big Japanese publisher Kodansha, being the only British writer to do so. In fact, he is the only pro manga writer from Britain who lives in Japan. He is also the editor of the critically acclaimed collection 'AX:alternative manga' (Publishers Weekly's 'Best ten books of 2010' and nominated for a Harvey award). Working with various Japanese artists he has written a unique line of Japanese history/martial arts/Samurai books, including The Book of Five Rings, Secrets of the Ninja, The 47 Ronin, and Cold Mountain (winner of China Comic and Animation Competition 2015 ‘Best Overseas Comic’ award). In 2016 his book 'The Faceless Ghost' was nominated for the prestigious Eisner Book Awards, and received a medal in the 2016 'Independent Publisher Book Awards'. In 2017, his book Secrets of the Ninja won an International Manga Award from the Japanese government - he is the first British person to receive this award. His main influences remain British and American creators - such as Alan Moore, Grant Morrison, Eddie Campbell and Harvey Pekar. He often gives lectures and talks about comics in schools and colleges, and writes articles for such places as The Japan Times, The London Economic and The Herald Scotland.